With nearly 500 stores across five countries, we're a one-stop source for domestic, international, and freight shipping services. When you visit your local Sheridan Pak Mail, we'll find the most cost-effective, safe way to pack and ship your items, whether it's by air, ocean, or ground. Welcome to Sheridan Pak Mail! 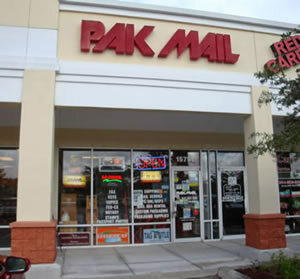 Sheridan Pak Mail is conveniently located in the Coquina Plaza and we are the most complete packing and shipping business you will ever use. Do you need to ship something internationally? Our services include: International Shipping, Door to Door (specializing on Latin America), Mailbox Rental (24hr Access), Money Transfer & Bill Payment, Phone Cards, Notary Public, Copy & Fax Services, Translation, Lamination, Binding, Business Cards, Passport Photos, Internet Access, Key Center, Custom Packing & Supplies, Auto Tag, UHaul Rental, and more.